I wanted to do a lesson on some essential Buddy Guy licks… but he’s somewhat of a chameleon, able to adapt and change based on the situation and the music going on around him. But what is unmistakable in Buddy Guy’s sound is his speed and use of cool little flurries… so I took an idea that he uses a lot in the song, “Things I Used To Do,” and did this lesson on that idea. 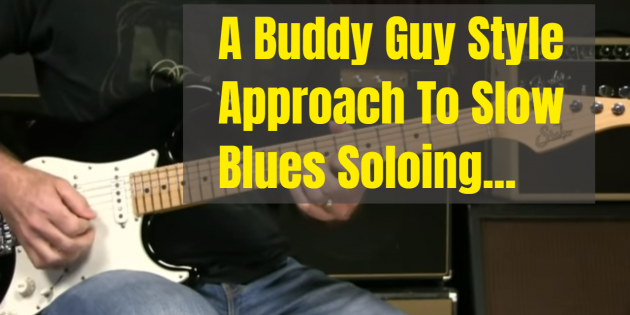 Hopefully you can try this approach for yourself and inject a little Buddy Guy into your own playing. Great lesson Griff. Really useful. Thanks for that. What make and model looper do you use? Is it just me ? I must be missing something, but I think the video started with you playing in G then you were showing us things in A. Is that right? Nope — exactly right David! I noticed the same thing, but the pattern is the same so can be used in any Key. NICE ONE! LAST VIDEO, THIS PART OF YOUR SITE HAD A.PUP VIRUS FILE. GLAD IT’S GONE. I DID TELL YOUR TECH SUPPORT. THIS VIDEO, HAD PORBLEMS. IT WAS NOT IN TIME WITH THE AUDIO AND WOULD FREZEE THE VIDEO, BUT THE AUDIO WOULD GO ON. STILL WAS A GREAT LICK . THANKS GRIFF. PS; MAY BE MY FLASH PLAYER. Greatly appreciate that you share your time and talent, hoping to one day be maybe half as proficient as your talent reveals. Your one of my main go to for YouTube lessons. Hoping to be able to afford your course one day. Again, thanks so much for doing these lessons. I learn something new every time. Very informative lesson Griff. I truly value your approach and have learned so much. I saw Buddy last month during his January residency with Quinn Sullivan. If you get a chance to see Buddy, take it, he will not disappoint. At 82 he is still kicking it! Buddy guy has a night club in in Chicago and plays there frequently,when he isn’t playing there you can always catch great acts from the Chicago area and around the country. Boy that gets your Left Eye Jumping. Thanks Griff. Great as always.